A heart rate monitor is a great tool for tracking the intensity of your workouts, but most require a chest strap to capture your heart rate, which isn't always convenient. An alternative is the Mio, which offers a strapless option. You don't get a continuous heart rate reading with this type of HRM, but it's a good choice for exercisers who don't want to fuss with a chest strap. The Mio also comes with a number of features, including weight loss tools and a variety of timers, making this a good choice for beginners as well as veteran exercisers. I've used a variety of heart rate monitors in the past, but this is the first time I've tried a strapless version. I was a little skeptical, since I'm used to seeing my heart rate throughout my workouts. But after trying it, I think there's a place for the Mio in my workout routine. The initial set-up of the Mio involves entering basic information, such as weight, gender, activity level and weight loss or weight gain goals. Once you're through the set-up, your Mio is ready to use. For a basic heart rate and calorie monitor, you can start the timer and periodically check your heart rate throughout the workout by placing your thumb and forefinger on the leads on either side of the watch. It takes several seconds for your heart rate to display, and you have to make sure the watch is snug against your wrist to get a good reading. One interesting feature of the Mio is the weight management program. The included booklet explains the program and gives instructions for how to use the Mio to track your weight loss progress. It works by calculating your daily caloric needs (based on the information entered during the set-up) and the calories burned during your workouts. You can enter the calories you eat each day, and Mio will determine if you're on track with your weight loss goals. While the weight management program is a bit complicated (I had to read the directions a few times), it's a great tool for exercisers who are counting their calories. Count Down, Count Up: This timer counts down to zero and then starts counting up. This is perfect if you want to separate your warm-up from the rest of your workout.Walk/Run Interval Timer: This dual timer allows you to set intervals for walking and running. You can set each interval for as long as you want (e.g., one minute of running followed by two minutes of walking) and choose how many cycles to repeat. The timer beeps when you reach the end of each interval. Count Down and Repeat: With the repeat function, you set the timer for a certain length of time. When it gets to zero, it beeps and starts over. This is great for exercisers or athletes who do repeats as part of their training. Another feature I liked was the information shown on the screen. During your workout, you can take your heart rate at any time. The screen shows your heart rate in beats per minute, the percentage of your maximum heart rate and your performance (a bar at the top indicates your effort level). The Mio will also scroll through different screens to show you how many calories you've burned so far. The nice thing about not having a chest strap is that you can use the Mio at any time and get a sense of what your heart rate is during different activities, motivating you to work a little harder. Easy to use — While some features take time to figure out, the basic functions of the Mio (the heart rate information and timers) are easy to use. The numbers are large and easy to see on the wide display.Comfortable — The Mio is just the right size. It's big enough to see the numbers, but not so big that it feels bulky. Both men and women can wear the Mio. Calorie-counting features — The weight management tools are great for exercisers who want to lose or gain weight. Doesn't require a chest strap — I liked having an HRM I could use without a chest strap, particularly for unplanned activities like walking at work or working in the yard. Accurate heart rate — I compared the Mio with my other HRM and found that the heart rate was the same on both watches. Decent price — At about $99.95, the Mio is priced at about the same level as most quality heart rate monitors. Stopping during the workout — Some users may be more coordinated than I am, but I had to stop exercising to check my heart rate, which interrupted my workout. Difficulty getting a reading — There were times I couldn't get a reading at all. 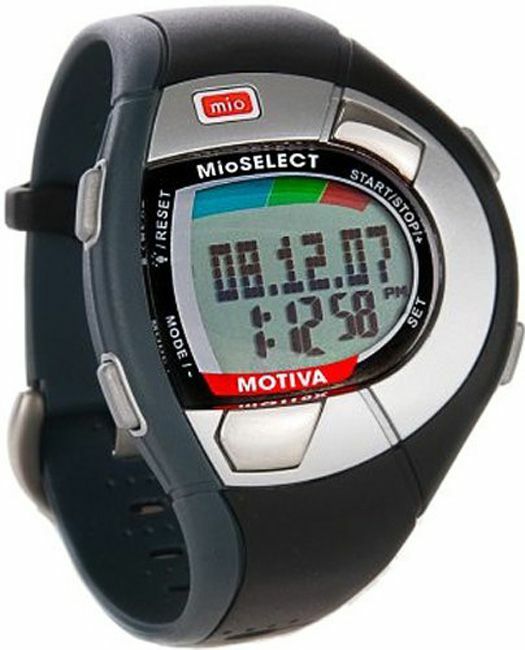 The manual recommends wetting the leads and back of the watch to improve contact, but that didn't always work for me.May not appeal to exercisers who use a chest strap — While I liked the Mio for some types of workouts (spontaneous walks or strength training workouts), I didn't like it for cardio workouts. I'm so used to seeing my heart rate with my usual HRM that having to stop my workout to check my heart rate was a bit frustrating.